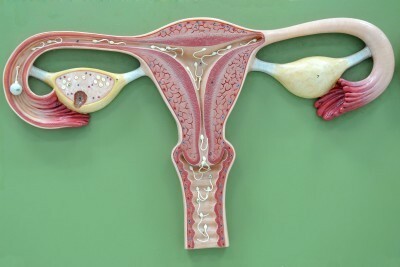 Although you might get your period, it does not necessarily imply that you ovulated. There is something called anovulatory cycles, which are cycles where ovulation simply doesn’t happen. 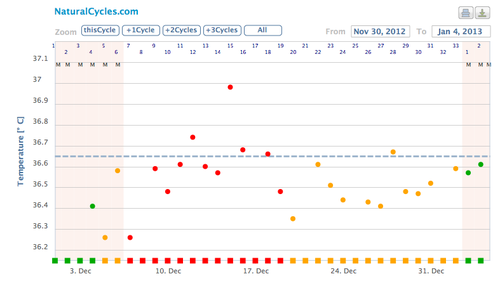 This might be difficult to notice unless you are tracking your cycles and charting your temperature, but might also show up as delayed menstruation and mid-cycle spotting. Anovulatory cycles tend to occur occasionally throughout the childbearing years and are then a rather common cause of infertility. They are however most common during adolescence and in the years before menopause. The picture below shows a temperature chart of an anovulatory cycle of a real woman. The anovulatory cycle is often longer than usual. It does still end in a bleeding, caused by the lack of estrogen rather than progesterone, as is the case for a normal ovulatory cycle. Anovulation can arise from a number of causes, ranging from severe diet and exercise or stress to complex disruptions in the relationships between tiny glands in the brain that control our most basic functions. Hormonal imbalances are the most probable cause. An intense program of exercise can interfere with the ovulatory cycle by suppressing the output of hormones called gonadotropins from the hypothalamus in the brain. The disorder may also result from hypothalamic dysfunction, hyperprolactinemia, polycystic ovary syndrome, luteal phase defects, or tumors of the pituitary gland adrenal gland or ovaries. Another possible contributor to anovulation is the long-term use of certain medications. Steroidal oral contraceptives (the Pill) could likely be responsible. These drugs work by intentionally disrupting the hypothalamic-pituitary-ovarian axis, suppressing ovulation and thereby preventing pregnancy and this often causes prolonged anovulation also after quitting the pill. If you suspect you might be having anovulatory cycles, you should track your cycles and detect your ovulation by measuring your basal body temperature. 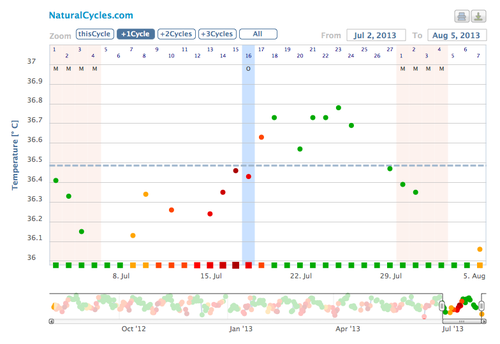 NaturalCycles keeps track of your anovulatory cycles for you and NC Planning even gives you fertility advice accordingly. If you discover that you have such a problem you should consult your doctor, as there are treatments and medications that could help.